Our new briefing ‘Drone Wars: Out of sight, Out of mind, Out of control’ highlights some of the key issues surrounding the growing use of armed drones. In a readable and accessible way it examines the arguments around their development and growing use, civilian casualties, how drones have enabled a rapid expansion of targeted killing and how drones are lowering the threshold for use of armed force. The Drones Quilt is a project by the Fellowship of Reconciliation, drawing attention to and remembering civilian casualties of so-called accurate drone strikes. It is made up of squares of fabric, contributed by members of the public, FoR members, other peace charities and student groups. Each square bears the name of a civilian killed by a drone (from Yemen, Pakistan, Afghanistan…) Most of the names are provided by the Bureau of Investigative Journalism. 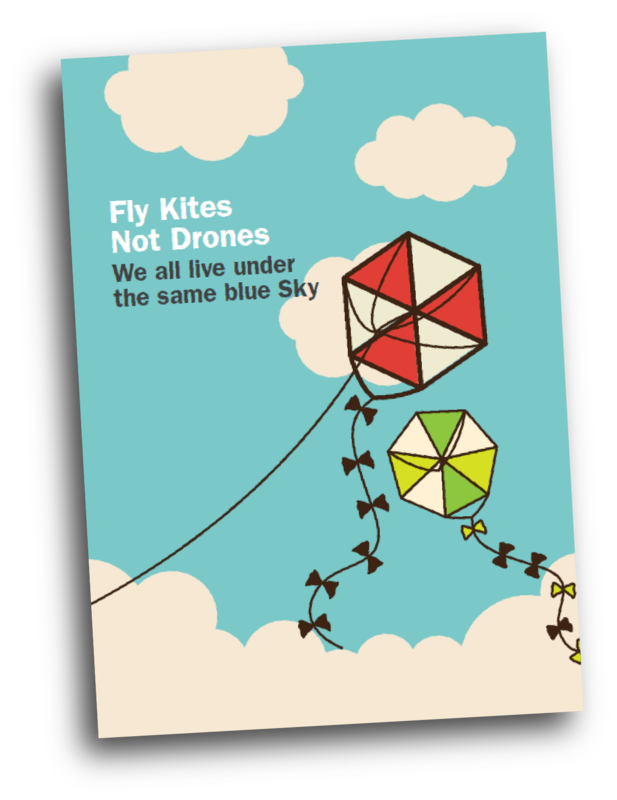 Each month, we put out a concise newsletter with news, events and updates about campaigning against armed drones. This will be valid until next summer. Please ask your MP to sign it. On a semi-regular basis, the Drone Campaign Network (DCN) produces a briefing about developments in drone warfare, arguments against armed drones and campaign info. The Drone Campaign Network have produced a number of resources which can be used during the Week of Action including a Breifing, flyer, petition and posters. You can either download copies from here or order hard copies via info@dronecampaignnetwork.org.uk. Please note that we need to ask for a donation to cover the costs of printing and postage. Email us to know what resources you would like and when you receive your resources please send us a donation. 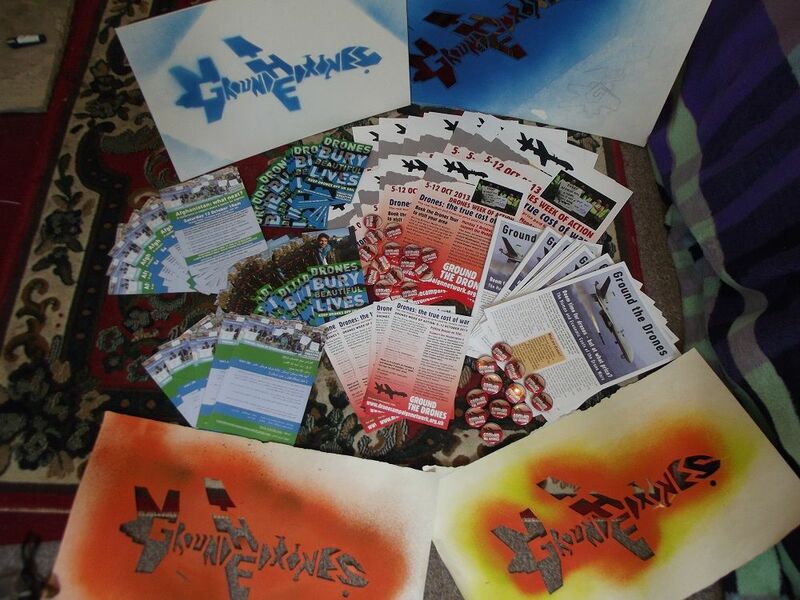 Please send a cheque (payable to Drone Wars UK) to Drone Campaign Network c/o Peace House, 19 Paradise Street, Oxford, OX1 1LD. Many thanks. 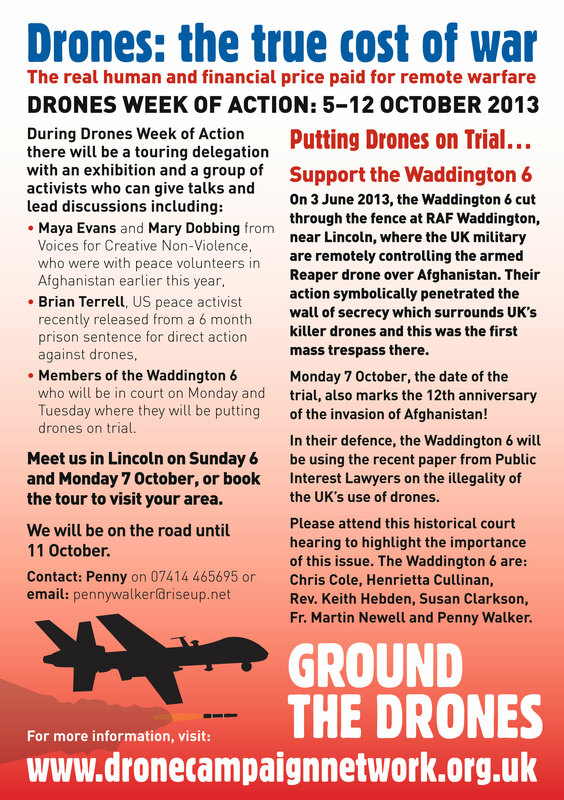 Members of the ‘Waddington 6’ (first mass trespassers into RAF Waddington drone base) are standing trial on the 7th October in Lincoln, COME along and support them OR invite them to SPEAK in your area during the week of action. There are 9 potential speakers and thye are happy to travel. 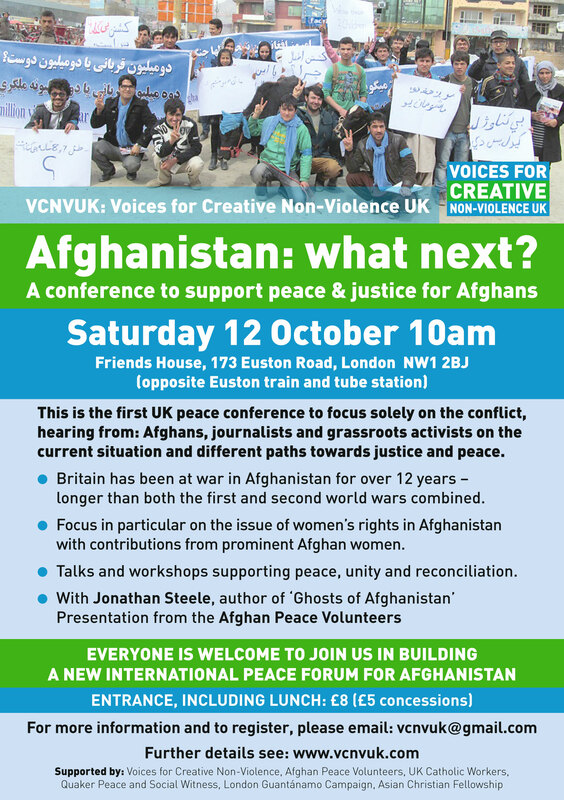 A refocus on the Afghan war with speakers including Jonathan Steele, female Afghan grassroots activists and live link up with the Afghan Peace Volunteers in Kabul. Also a full afternoon of workshops and discussions.